I realized at Vericon that although my collection of roving is shiny, it could stand to have a little more purple in it. Everyone’s favorite color is purple. (That’s not 100% true; my favorite color is green). Or at least, lots of people like purple roving. So I know next year I will have lots of purple at Vericon. In the meantime, I dyed some purple roving last week (as well as roving of other colors). This was the first time I had been able to dye in several weeks. It was quite fun, even though I should have been working on the paper that was due the following Monday (I ended up getting an extension on it…). I like how the batch turned out. And I’ve finally got it down so that the roving doesn’t felt at all. (The roving that I’ve made that was slightly felted was still spinable, but I had to use a lot of pre-drafting.) My technique for dyeing has been steadily improving. The key is for the water to be just below boiling, and to make sure you are only boiling it for 45 minutes and no longer. And you have to check the water every so often so you can turn the heat up or down as necessary. Not such a hard thing to do, but it means you can’t go off for an hour while your dye sets. These rovings are destined for the Etsy shop, save for one of the 3 purples, which is destined to be spun by me first. Though maybe I’ll keep one. I haven’t done much dyeing for myself. Circumstance the first: Over the winter break I sadly neglected to bring along the pattern for my present needlework project. As my knitting and spinning tools no longer live in Michigan, this left me at a bit of a (cough) loose end. Circumstance the second: While I was muttering over circumstance the first, my family home was the site of a lively dialogue of the subject of steampunk and related fashions. Here, for example, I stitched every other stich on the main line moving rightward, pausing when I reached an acorn to sew that as a branch of the main design, and then finally returned leftward along the line filling in the missing stitches. Seeing as that hadn’t been a catastrophic failure, I attempted something more complicated next. With these elements complete, I gathered up red and black fabric scraps (available to me through the kind auspices of my aunt) and went to work on the scarf. I started by framing the larger piece of embroidery in heavy black satin, exercising a certain paranoia concerning the seams because of the fragility of the linen. 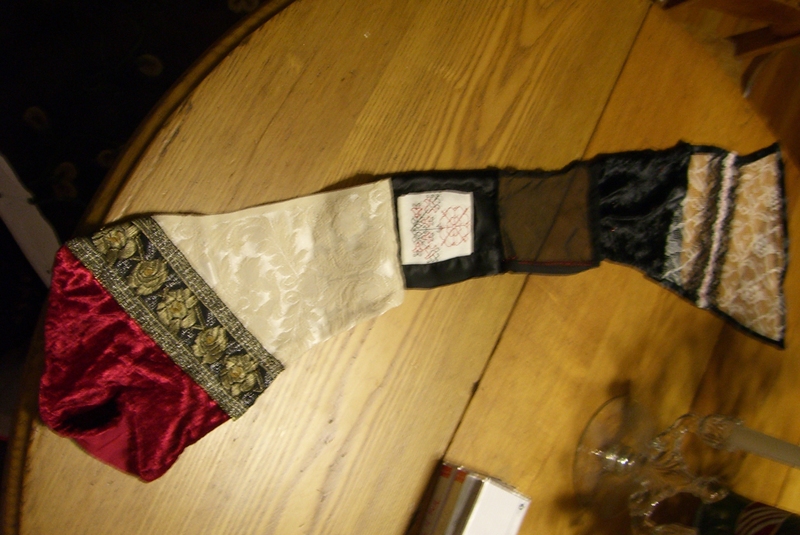 From there, the left side of the scarf (cream semi-upholstery fabric, gold brocaded ribbon with small beads at the centers of the roses, red velveteen) fell together quickly. The right side, conversely, proved difficult. I despaired of getting the transparent fabric to take a seam without unravelling entirely – I suspect this to be the fault of my lack of technical expertise – and ended up using a selvedge on one side to reduce this issue. 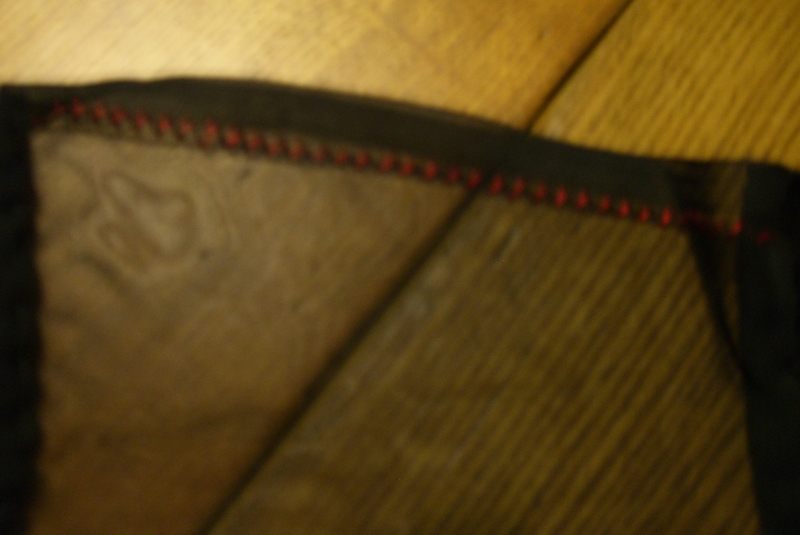 However, there were two small rows of holes near the selvedge, as is often the case, which looked odd; I resolved this by using yet more of the red thread to make a row of half-stitches through said holes, which helped considerably. So as to not have too much unrelieved black, the velveteen patch that followed acquired a scattering of red seed beads as well. Then came the white lace. I’d cut a large piece with the idea of folding it over for a hem, but this made the fabric look heavy, so I encased the edges in a bit of black ribbon instead. 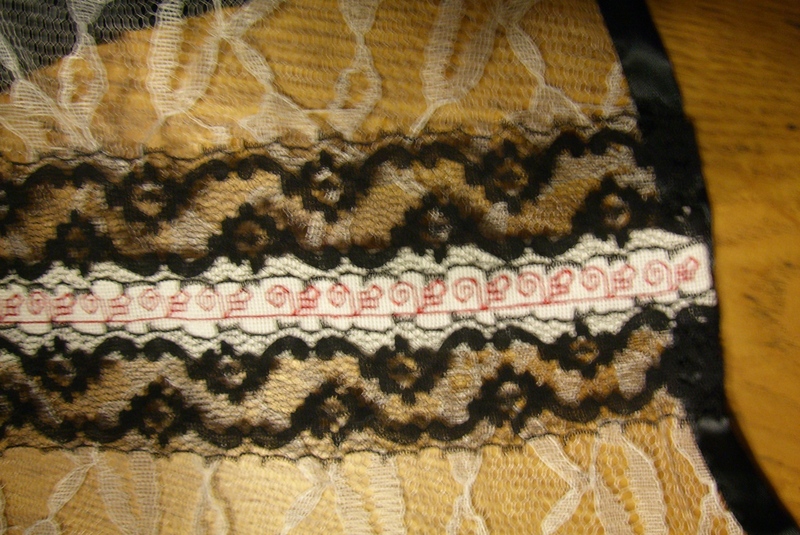 Hence the lace patch was wider than intended. My band of blackwork acorns, however, was narrow, and I’d meant for it (and the black lace with which I’d framed it) to cross the scarf slantwise. Therefore I thought I would have to narrow the scarf with the next patch of fabric, but all attempts at this produced utterly ungraceful results. All seemed lost; I cursed my lack of proper planning. However, in one of those mercies reserved for those with more enthusiasm than sense, I discovered that the blackwork band with its stiff black lace was not displeasing when laid across the looser white lace. Relieved, I sewed down the edges of the acorn band (leaving the center free to move independently of the background), declared myself done, and gave it to a friend by way of holiday gift. In my misspent youth, I purchased a printed cross stitch kit, worked about a third of it, and never finished. Flush with vernal free time and a determination to finish the dratted thing, I picked it up again some two months ago. Here is the result. I also had a couple of comically awful problems with the kit — for example, the color chart called for green flowers and purple stems on the border, in contrast to the picture provided. I decided this was a little too surreal for the tone of the work. Moreover, it provided thread in rather wacky amounts: there was as much yellow in the kit as all the greens combined, despite only four yellow stitches appearing in the pattern. It also didn’t note the identifying DMC numbers of the colors, which led to sundry thread-matching shopping expeditions. But despite all this havoc, I’m rather pleased with how it turned out. Next step: very careful ironing and framing. When my husband and I went to visit his parents a few weeks ago, they showed us a new acquisition: an embroidery that depicted a tiger on one side of the cloth, and a leopard on the other side. Apparently the technique of double-sided embroidery is a specialty of the Chinese province Suzhou, home to one of four principal schools of Chinese embroidery. Let me say first that this embroidery was a masterwork in every respect. Both the tiger and the leopard were exquisitely realized in silk, and somehow–I’ve only begun to think about how–the embroiderer had arranged the threads so that when light falls on the tapestry it highlights and shades the animals as though they were three-dimensional. But it was the two sides of the embroidery that most entranced me. 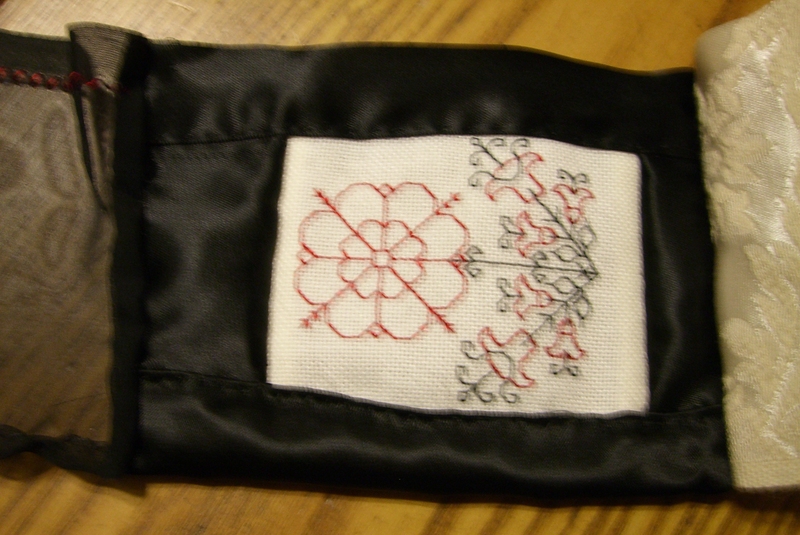 I’ll never be a great embroiderer, but I’m a competent one, and I basically understand how embroidery works. But this… when I first saw it, I couldn’t wrap my mind around how it could possibly be done. And so of course I had to try to figure it out. By definition, in order to embroider on both sides of a piece of cloth, the two patterns have to involve the same color at every point where the needle goes through the cloth. The difference between the pattern of threads on the two sides of the cloth may arise only from the different paths taken between points. Tigers and leopards were far beyond me, but I started thinking about pairs of very simple shapes that could be described in terms of lines that shared end-points. The first such pair I thought of was a heptagon and a seven-pointed star. The principle was clear: on one side of the fabric, you stitch around the edges of the seven points; while on the other, you pass from one point to the point nearly opposite it and thus form a star. 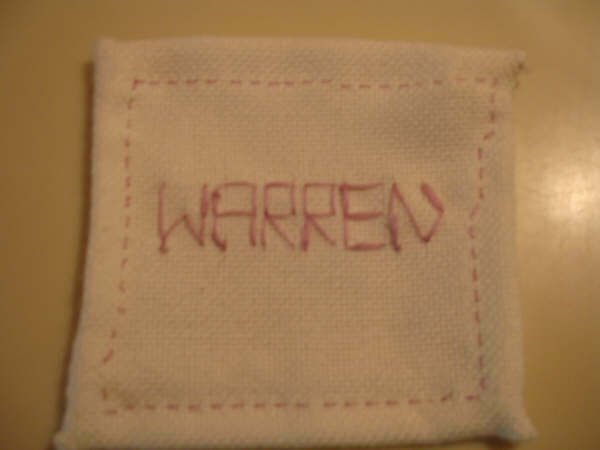 Of course, this is complicated by the necessity of alternation of stitches–when the needle goes down on one side of the fabric, it comes up on the other, and therefore it’s necessary not only that the two shapes share points, but that it be possible to make all the necessary lines on each side by alternating stitches. My spatial skills are lousy, but with a pen and paper and some thought, I was able to demonstrate that it is possible to create a heptagon on one side of a cloth and a heptagram on the other without repeating any stitches or cutting the thread. I’ll reproduce my work if you’ll forgive the hideous quality of the graphic. From there I moved on to something slightly more elaborate: text. Casting around for two words of the same length, I settled on “Warren” and “Claude”–in honor of my husband and his father (I figured I had my in-laws to thank for the initial inspiration, and since Warren and his father are in many ways similar I supposed they would enjoy being represented as flip sides of a coin, as it were). The first challenge was to figure out how to represent WARREN and CLAUDE (with one as the mirror image of the other) with the same set of dots. This involved a little artistic license regarding the shape of a few letters, but eventually I came up with a pattern that seemed legible on both sides. For the sake of simplicity, I had originally intended to make each pair of letters correspond, while admitting that it would be more elegant to offset them such that I could create spaces between letters on one side by running thread on the other side as part of a letter. I ended up deviating from this principle once, treating LA and RE as a unit (it turns out to be pretty difficult to make L and E out of exactly the same dots, but adding A and R to the mix solved the problem). I also made use of the fact that, while it’s possible to define a line with two dots, there’s no harm in adding additional dots to a line if they’re helpful on the other side. When it came time to figure out how to realize these letters in alternating stitches, it quickly became apparent that, whereas it’s possible to create the star and the heptagon without repeating any stitches, it was not similarly possible with the pattern of dots I’d designed for the letters. Lots of repetitions proved necessary, as well as the (still more inelegant) practice of sticking the needle through the middle of a line shared by both sides, thus duplicating half of a line in order to change the orientation of the needle and allow me to make a particular stitch on the right side of the fabric. I display the result below. Executing the pattern with thread and cloth, I came up against a couple of unanticipated practical implications of a double-sided embroidery. Since there’s no back side, there’s nowhere out-of-the-way to tie knots. When both sides of the fabric are equally important, hemming becomes more challenging. Some other technical challenges had nothing to do with the double-sidedness of the project–for one thing, the cloth proved surprisingly anxious to unravel and uninterested in being hemmed; for another, I did the embroidery in the middle of the night and in the middle of studying for exams, and it’s thus messier than it would have been otherwise. If I were doing this again, I would twist repeated stitches together (wrapping the later ones around the earlier ones) so as to ensure that they look like a single line rather than like two. Nevertheless, as a first attempt I’m pleased with it. Questions remain. How do techniques change when you’re covering blocks of space rather than tracing lines? Covering area seems harder to visualize to me, but it may actually be easier, since a block of color provides cover for knots and for midpoints on the other side. 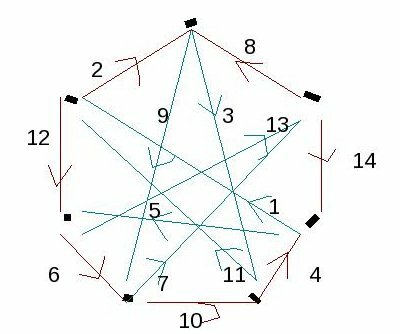 I continue to be curious about what properties a pair of shapes need to have, absolutely and relative to one another, in order that they can be embroidered without any repeating stitches–but I figure this as a problem for mathematicians. I’ve asked several, and await their thoughts. Having satisfied myself of some capability to reproduce the wheel, I may turn in future projects of this sort to explanations of how they do it in Suzhou. Silkspinner has also pointed out that a similar technique exists in the medieval European embroidery technique known as Blackwork, and it may be worth investigating that as well. I’d love to hear any thoughts on next steps, especially regarding other sources for further investigation of this sort of embroidery, and the thread-path questions raised above.